Barnsley midfielder Kenny Dougall has revealed he tried to play on against Doncaster despite a broken leg. Dougall is set to miss the rest of the season after suffering the fracture in Friday's 0-0 draw in League One. But he revealed on Instagram that he tried to continue before being substituted in the 18th minute. "Injuries are part of the game and unfortunately I've been hit with another tough pill to swallow," the Australian posted. "Full trust in the lads to get us up into the champ! Don't know why I've tried to play on with a broken leg but nobody can say I didn't try." Barnsley said in a statement that Dougall will be assessed by a specialist this week but he is not expected to feature again this season. 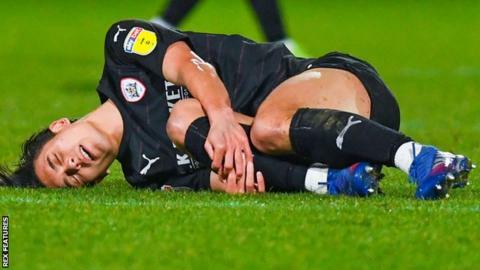 Tykes striker Kieffer Moore has already been ruled out for the rest of the season due to concussion. Daniel Stendel's side are second in the table, two points ahead of third-placed Sunderland, having played a game more.